As part of NAHRO's Housing America campaign, a poster contest is held each year for children residing in affordable housing and community developments owned or administered by NAHRO member agencies. Posters reflect the national theme of “What Home Means to Me.” The contest is a collaborative effort of NAHRO’s chapter/state, regional, and national organizations. National honorees are selected from chapter/state-level winning entries. NAHRO will not accept submissions from individual housing authorities. Any submissions sent directly to NAHRO will be disqualified. 1) NAHRO member housing authorities submit their entries to their local/state NAHRO chapter. If your local/state NAHRO chapter does not hold a poster contest, contact your NAHRO regional council for more information regarding their poster competition. 2) Local/state NAHRO chapters may submit entries to their regional council. 3) The regional councils hold separate contests and send their top three winners (one from each age category) to NAHRO. ​4) NAHRO holds a national contest to pick the 13 national winners. Contest participation is open to all children in grades K-12 residing in affordable housing assisted directly, supported under community development, or participants in affordable housing programs administered by a NAHRO member authority (i.e., public or Section 8-assisted housing CDBG, HOME, LIHTC). Entries must be created by only one person. Entries created by two or more people will not be accepted. Refer to the application for poster size and theme requirements. 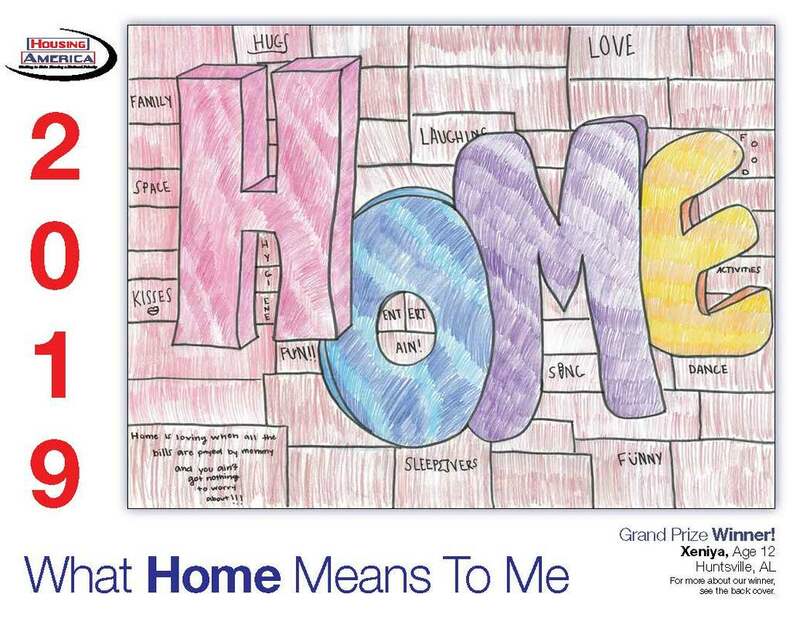 Housing authorities must be active NAHRO members to participate in the “What Home Means to Me” poster contest. Housing authorities submitting entries to the national poster contest must first send entries to their local/state NAHRO chapter or NAHRO regional council. While local state/chapter contests are optional, NAHRO encourages local/state NAHRO chapters to host their own poster contests and submit the winning posters to their regional council. If your local/state NAHRO chapter does not hold a poster contest, contact your NAHRO regional council for more information regarding their poster competition. Each regional council will determine a deadline for their poster contest entries and a date for regional judging. NAHRO is not involved in the scheduling or management of regional council contests. The eight regional councils will select three winners –one from each age category – and forward those winners to the national competition in Washington, D.C.
National honorees will be selected by a panel of judges assembled by NAHRO staff. National honorees will be announced during Housing America Month in October. All eight NAHRO regions will be represented in the calendar. Deadline for submission of regional honorees to NAHRO is Friday, August 2, 2019. The 2017 "What Home Means to Me" calendar contest winners were announced at the National Conference and Exhibition in New Orleans, La. Friday, October 14 during the Opening Plenary. The 2016 "What Home Means to Me" calendar contest winners have been selected. Winners were announced at the National Conference and Exhibition in Los Angeles, Calif. Friday, October 16 at 9 a.m. during the Opening Plenary.